A photo taken of me at one year. It's a favorite, I think mostly because it makes me laugh. 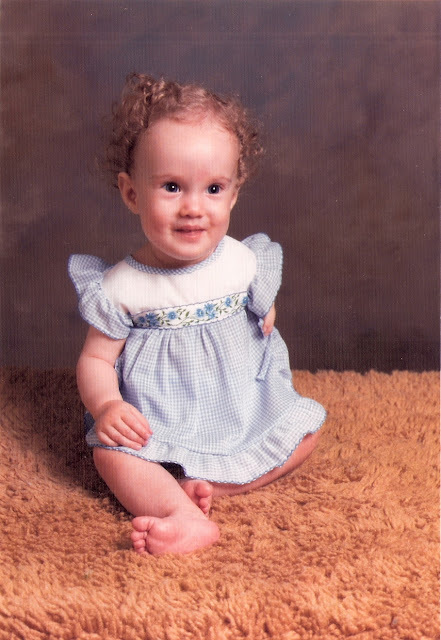 Notice my left leg tucked under the dress, creating the illusion that I am missing both an arm and a leg on that side. I'd like to think this was an early sign of a career in comedy. I did usually keep one leg pulled back, using the other leg to pull myself along the floor instead of crawling. At least I had some diaper padding to scoot on; well, a cloth diaper...my parents were hippies. But just look at those eyes and tell me there wasn't some mischief afoot. It's like she knows, one day, Joey will bite her arm. Little Miss Bright Eyes! And the shag carpet courtesy of Sears! Mischief in those eyes and anarchy in those curls. Too cute!